N.C. Rep. Rob Bryan, a Republican from Mecklenburg County and perhaps the legislature’s biggest champion of achievement school districts, unveiled a new draft of the bill Wednesday that would legalize the controversial model in North Carolina, but at least one powerful House Republican questioned whether the state could afford the reforms. Bryan told legislators on the House Select Committee on Achievement School Districts that he hoped the panel would take a vote on the bill by mid-April, in time for the full legislature’s reconvening on April 25. Achievement school districts would allow state leaders to pull chronically low-performing schools into one district, regardless of geography, and possibly turn over management of the schools, including staffing powers, to charter operators. 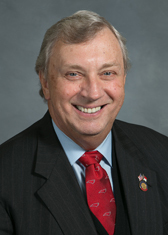 However, Rep. Craig Horn, the Republican from Union County who chairs the House Education Appropriations Committee, seemed to question the likelihood of its approval in the legislature’s short session this year, noting it’s unclear how much support the proposal has in the state Senate. Committee members heard dueling presentations on the district’s use in Tennessee in recent years following a $500 million federal grant, with at least one district leader in Tennessee touting it as a boon for students, despite middling numbers reported by Vanderbilt University education researcher Gary Henry. But, on Wednesday, Horn emphasized that the bill has a “critical” need for community buy-in. The new draft of the bill released Wednesday includes a handful of additions to the proposal, including the use of “iZones,” a locally-run method of school turnaround involving new flexibility, funding and development that reported “significant” gains in school performance in Tennessee, according to Henry. “I don’t view it as a silver bullet to miraculously solve all these problems,” said Bryan.